Synopsis of "Hole in the Wall"
Journalist and filmmaker Rory O'Connor, producer of the FRONTLINE/World segment "The Hole in the Wall," went to New Delhi to report on an experiment that turned into a project that sends slum kids into cyberspace. Read his notes, exclusive to FRONTLINE/World's Web site. I arrive in New Delhi just a few days ahead of the annual monsoon. A thick, dark, gray mass of humidity and toxic pollutants masks not only the sun, but the entire sky. The heat practically singes my eyebrows whenever I go outside -- it's 48 degrees Celsius to be precise, which translates to a nearly unbelievable 118 degrees Fahrenheit. I've just spent several sweltering weeks shooting a film on poverty in the northeastern state of Bihar. A third of India's population -- 350 million people -- exist on an income of one dollar per day per family, and tens of millions of them reside in Bihar, the poorest of all India's states. But here in the capital, India's economic contradictions loom even larger. Unlike in Bihar, the abject poverty here exists amidst the most modern plenitude -- gleaming office towers, five-star hotels, a sizable middle class and some of the world's most advanced high-tech firms. One of those high-tech success stories is NIIT, a computer software and training company with offices in dozens of countries and annual sales of nearly $300 million. In an arrangement that is apparently fairly common in Delhi, NIIT's corporate offices are located next to a fetid slum, where people live in what can only charitably be called shacks, with little access to sanitation and health care. A high, thick boundary wall separates the two worlds. It's the wall -- or more precisely, what's inside it -- that has brought me to NIIT. I'm here to see the firm's head of Research and Development, a round, affable and highly articulate man named Sugata Mitra, whom I first met two years ago. Although a physicist by training, Mitra has specialized for more than a decade in the areas of cognition and consciousness, delving into the mysteries of how people, particularly children, learn. Mitra has some provocative ideas on the connection between learning and poverty. "Poverty has two different definitions," he tells me. "Poverty of information is one kind of poverty; poverty of materials is another kind of poverty. The same method may not apply to solve the two problems." Mitra observes that the developed world has spent billions of dollars over decades trying to solve the problem of "material poverty" with little success. He speculates that if the problem of "information poverty" is addressed instead -- by providing poor people with access to information they need and can use -- then the poor "might just figure out how to solve the problem of material poverty by themselves." Mitra, of course, doesn't claim he has the solution to world poverty, but he's fascinated by figuring out how he can help poor people, particularly kids, become information-rich. And when he starts to describe his first attempts to help slum dwellers access information, he grabs my attention. In 1999, with little fanfare, Mitra had launched an experiment that soon began to make waves within the community of people concerned with the so-called digital divide. He tells me it started when he played a bit of a trick on his employer. "In 1988, I had written a very short paper to say that maybe children are capable of learning a whole bunch of things on their own, and specifically, perhaps computers," Mitra explains. "I got taken with my idea. But nobody else did." He bided his time. Eleven years later, NIIT executives expressed an interest in researching the uses of public kiosks stocked with computers. Street kiosks -- where passersby could access computer terminals for a fee, along the model of public telephones -- were considered a promising business opportunity. "It had nothing to do with children," Mitra says, with a grin characteristic of a Cheshire cat. "It was because kiosks were expected to become big business. Since I was heading R&D, I got the job to see how to build a kiosk." Mitra asked if he could have some money to build a kiosk that could stand outside in the open. When Mitra got the go-ahead from his employer, he realized that he had an opportunity to try the idea he had proposed more than a decade earlier: to offer a computer out in the open to children who had never seen one before. Like many great ideas, Mitra's was essentially simple. He cut a hole in the boundary wall separating NIIT from the adjacent slum, put a high-speed computer connected to the Internet in the hole, and turned it on. To his amazement, the local slum children were browsing the Internet within hours. "It was a spiral of self-instruction, if I can put it that way," he recalls. "One child makes an accidental discovery. Three children come and repeat that, saying, 'Oh, that's cool.' If three children repeat the same things, they make three other accidental discoveries. And it goes on and on and on like that, so that within the end of two weeks, they've got about as much instruction in their heads as they would have got in a classroom." 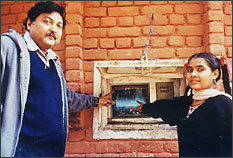 Since then, Mitra has been busy installing more and more computers in public kiosks for children to use. Sometimes they are placed in urban settings like the original; others have been built in small towns or rural villages. Each time the results have been similar -- children teach themselves computer literacy. The Hole in the Wall project has become famous in India and abroad because it seems to confirm Mitra's original brainstorm: Given access, kids will pick up knowledge on their own. Meanwhile, the business model for operating computer kiosks is still far off -- but NIIT is soaking up huge amounts of valuable real-world information about how the kiosk computers work best and how they're actually used. I sit in on a fascinating meeting with Mitra and members of his team of researchers, designers and engineers. Sanjay Gupta, a designer, says he was told that the specifications for the new design of the computer kiosk were that it must be able to run anywhere. "You just drop it, be it in a desert, or a seacoast, or a hilltop, and the damn thing should run," he says. The team describes how remote sensors now monitor the use of the computers, to give researchers an idea of how kids are using them. Ravi Bisht, a senior manager, says, "We can get a screen grab of the children, what they are doing at present at the particular kiosk. We can get their audio, the conversation of whatever is happening around the kiosk." Gupta agrees. "One of our researchers has a program that transfers what we call footprints. We have a complete log of the activity that took place at the kiosks in terms of Internet usage. Somebody visited a bank, somebody visited usatoday.com and so on, and along with this, you have the date and the time. It's complete recall." And the team discusses other possibilities -- joysticks that make the kiosks easier for kids to use (and that discourage adults); touchpads that can withstand the elements; kiosks embedded in concrete pillars; ways to make access to the Internet even faster. I ask the researchers if they'd be surprised if one day a kid realizes that he can communicate with anyone in the world from this box. Gupta pauses. "Oh, yes," he says. "Well, actually, yes and no, because the kids have surprised us enough already. So this won't really come as a big surprise because we expect surprises!" Mitra and his team continue to redesign the kiosks, collecting and analyzing data from the dozens of computers they've already installed and preparing to open more and more holes in the wall in the coming months. Mitra, dreaming about the possibilities, estimates that if he can make 100,000 computers accessible, "100 million Indian young people would teach themselves computer literacy within five years." Mitra tells me he plans to stop by the end of 2003, however, once he's installed a total of 108 public computers all over India. "That's the number of faces of Vishnu," he notes with a smile. What happens next, Mitra says, will depend on how much others value children and education. Globalvision features more useful information about the Hole in the Wall project, including the team of scientists behind it and the design, engineering, construction, data analysis and collection issues involved. Find on the site three compelling video-clips with scenes from an 82-minute film version of the story. A "daily development news channel," InfoChange India hosts articles and debates on India's social sector. The site covered the Hole in the Wall story. Nirmal Ghosh is India Correspondent for Straits Times Interactive. He reports on NITT's cognitive research team's Hole in the Wall experiment.